It’s early morning in Phnom Kok Lak, a small village in northeastern Cambodia’s Ratanak Kiri Province. 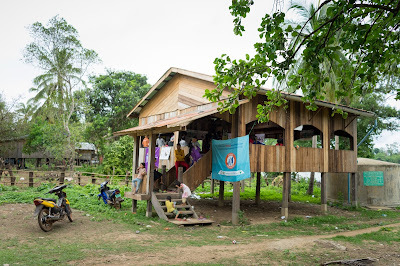 Dozens of children, mothers, pregnant women, and grandmothers have gathered at the local community centre, a stilted wooden house that overlooks the Sesan River. Today is an important day: trained staff from the nearest health centre will arrive shortly to delivering a number of simple but crucial health services, providing essential care to this remote community of farmers. About 600 people live in Phnom Kok Lak, mainly from the Lao ethnic minority group. Most rely on crops like beans, rice and cassava for their livelihood. Rough road conditions and lack of affordable public transportation make the distance between this small community and the health centre -- about 13 kilometres – a challenge for many families. It is known that two heads are better than one, but when an entire community comes together to improve the lives of their children the chances of success are even greater. That’s exactly the case of the Kampong Thmar commune, located in Kampong Thom Province. Under the leadership of Mr. Chrea Song, a charismatic member of this commune who is in his 60s, people came together to mobilize resources for WASH facilities in the local primary school. Mr. Song was born in Kampong Thom province to a very poor family. He was forced to drop out of school once he reached grade 7 because he cannot afford to continue. The expenditures were so steep, he had no other choice but to drop out. Due to the circumstances he had to start working to help support his family. His first job was at the market selling food with his parents. His resourcefulness led him to create his own business and became a respected entrepreneur within the commune. Although he wasn’t able to stay in school he valued education very much. He always knew he wanted to give the children in his community the opportunities he didn’t have. “Because I didn’t go to school my opportunities were very limited, I felt the need to change this for the future of the children in my community, they deserve a better quality of life” says Mr. Song. It’s only 6:30am, but the team members of the ‘Sokapheap Knhom’ (Sokapheap Khnom is Khmer for ‘my health’) project are already busy preparing for their long day ahead. From their offices at the Department of Fisheries, the teams load their fieldwork equipment, furniture and supplies into tuk tuks, ready to head out to the villages where they will spend the day. Team members load supplies and fieldwork equipment into a tuk tuk. One of the teams, led by Ms. Moeunnary Dy, heads to Khor village, Chran Chamreh Ti 2 commune in Phnom Penh. By the time they arrive, there are already mothers and children waiting. Teams such as this one are at the frontline of an innovative joint initiative by UNICEF, Institut de recherche pour le développement (IRD), and the Department of Fisheries, to conduct a longitudinal study of the same children and women over a three-year period. They monitor their health and nutrition and use the data to adjust programmes aimed at boosting the survival and development of children. Sena is an energetic three year old. She lives with her long term foster father Mr. Chan Inn, his wife and their two biological children. The family lives in a beautiful home in Siem Reap district, in Siem Reap province. Sena wakes up every day at 6:30am. She loves to eat apples for breakfast and enjoys playing with her siblings before they go to school. She takes a few naps throughout the day but most of the time she spends playing with her foster parents.